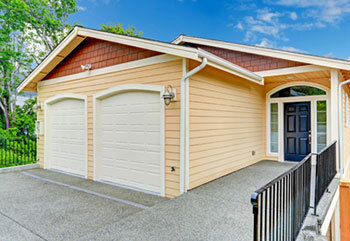 Home Blog Which Garage Door Style Should You Choose? For many people, the appearance of their garage door is an important part of their home’s aesthetic. It makes sense, considering that front-facing doors can take up to 20% of a house’s external space and there are countless ways that yours can stand out. Let’s take a look at some of the garage door designs that you could consider to instantly improve your home’s curb appeal. Just because they’ve been around for years, doesn’t mean that roll-up garage doors have to look dated or industrial. The latest design feature paneling can be enhanced with windows and painted to suit the home’s color scheme. Even though these types are mostly made of steel, you can choose to have a design that looks like wood or that is combined with wood for a more natural look. A carriage garage door is usually made from wood or steel, meaning it's likely to be pretty durable. Although they appear to swing out, these doors usually often only give that appearance and normally function as overhead doors that swing up. Carriage doors are particularly popular due to their historical throwback in terms of style; they can also be customized with a number of different window styles and a variety of paint finishes. They typically come available in square or arched shapes, and so are able to suit contemporary as well as more traditional styles of home. Aluminum is the material that most people think of when they look for a modern and sleek garage door design. They can also feature insulated or non-insulated glass panels with varying degrees of transparency, and framing finished in different colors to match the house. Aluminum doors are not as durable as some of the more traditional materials typically used for garage doors, but they can be strengthened with a heavy-duty frame. Aluminum doors are also typically available as a swing-up overhead option. Whichever style you choose, make sure you have it professionally installed by a company that follows the manufacturer’s quality standards! We can advise you further on the right option for your household - just give our Surprise, Arizona based technicians a call!